Turn on the TV to Food Network and there's a strong chance you'll see a New York City-based chef. Many of the contestants and judges on Chopped are restaurateurs and executive chefs in restaurants across the city. And the newest Iron Chef America is none other than Chef Geoffrey Zakarian of The National and The Lamb's Club. But right up there - in terms of prominence - is Marcus Samuelsson. Even before trying his food, Marcus is intriguing for a couple of reasons. He seems to have that pioneering spirit. He's highly attributed for the advent of modern Scandinavian cuisine during his years at Aquavit, a New York City legend. And now he's heading up Red Rooster, arguably the best of the current Harlem restaurant renaissance. I also love Marcus' multi-ethnic background, which reflects the incomparable diversity of the city. 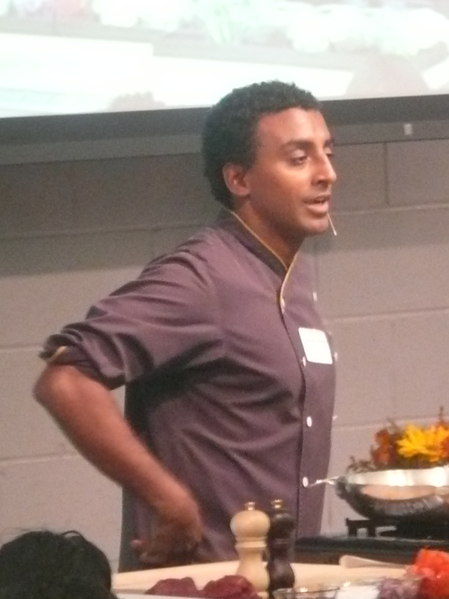 His Ethiopian heritage and Swedish upbringing have both informed his approach to cooking. I don't watch a ton of TV, but I do find myself watching a lot of Food Network lately. And watching these guys - whether they're competing to win $10,000 on Chopped or to become the next Iron Chef America - makes me feel right at home.